I am trying to run the following command based on the gihub src: https://github.com/husarion/tutorial_pkg. However, I am getting the below errors. How can I fix this (e.g. how to install frontier_exploration)? I’d appreciate any help. This means that you do not have frontier_exploration package installed. Thanks. It works now. I have one more question. When rviz opened up and I added all the objects with the correct topics, I see nothing - no map, laser scans, etc… Why is nothing showing up? Is there something I need to do in either Gazebo or Rviz to get this working? @lukasz.mitka Hi. Are you able to answer my question above please? Also, I did find some warnings as shown below. [ WARN] [1544334371.027983498, 2918.770000000]: Timed out waiting for transform from base_link to map to become available before running costmap, tf error: canTransform: target_frame map does not exist… canTransform returned after 2918.77 timeout was 0.1. First warning that you mention is related to tf frames publications. 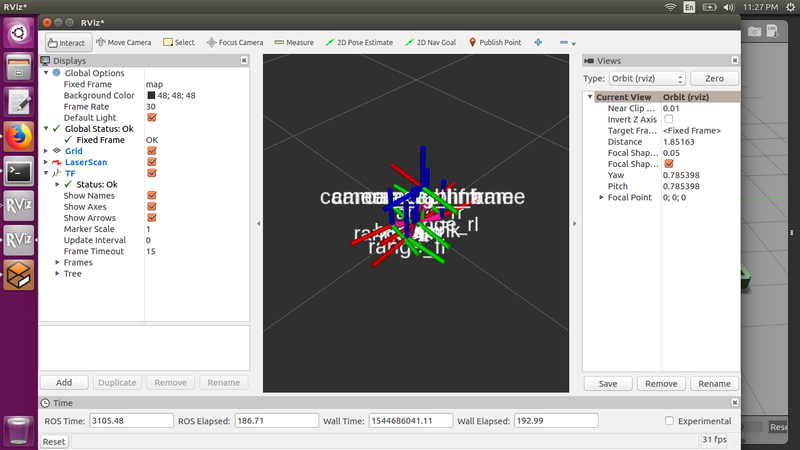 In rviz add the TF visualization and check if all frames are published correctly. Please tell me if there are any errors on TF object. I don’t see any errors in TF as shown below. What do you suggest? Map seems to be not generated. Were you successful on running previous tutorials, e.g. tutorial_7.launch or tutorial_6.launch? Each tutorial is based on previous one. It will be much easier to debug starting with easier ones. Please go through each tutorial, beginning from the first one and post here first problem that you encounter. I just want to see tutorial_8 working without doing the work right now. Do you have the entire ros_workspace I can just download and get it working? I just want to see the simulator working first before I actually purchase the husarion core. The tutorial_pkg and rosbot_description packages are all that is required to run tutorial. One more thing to check is the GPU plugin for Gazebo. Some GPUs, mainly the integrated ones have problems with proper rendering of laser scanner. Please tell me if that helps. @lukasz.mitka Thank you very much. It works now. How could I make the robot move faster though? Also how could I open an existing map and then continue navigation from that? Lastly, I see that the robot stops moving at a certain point as shown below. Why is this so, and how could I fix it? Robot speeds are defined in trajectory_planner.yaml file located in rosbot_description/src/rosbot_navigation/config. You should also note, that overall simulation speed could be affected by computer efficiency. You could use map_server for loading a map and amcl for navigation. Here is an example launch file. To save created map, you could use map_saver node from map_server package. Path planning perform better on high resolution map, I already updated gmapping node to 1cm grid. Please update your workspace and robot should pass entire maze without problems. because the saved map didn’t show up in rviz. Why is this so, and how can I get this to work with the gmapping code instead of the amcl? The gmapping is tool for building a map with no prior data regarding it, this node also determines position of robot in frame of map during the process. The amcl node is for determining position in frame of previously known map, the map for amcl must be provided by other node. 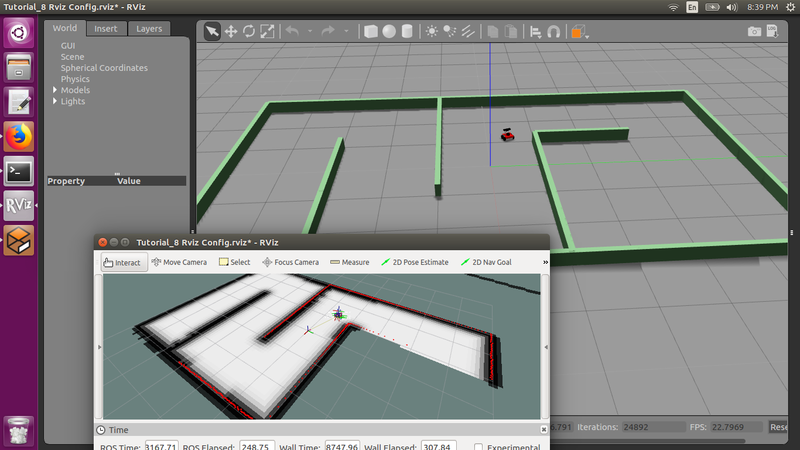 Start robot with gmapping and explore entire environment. While gmapping is still running, use map_saver to save a map to file. 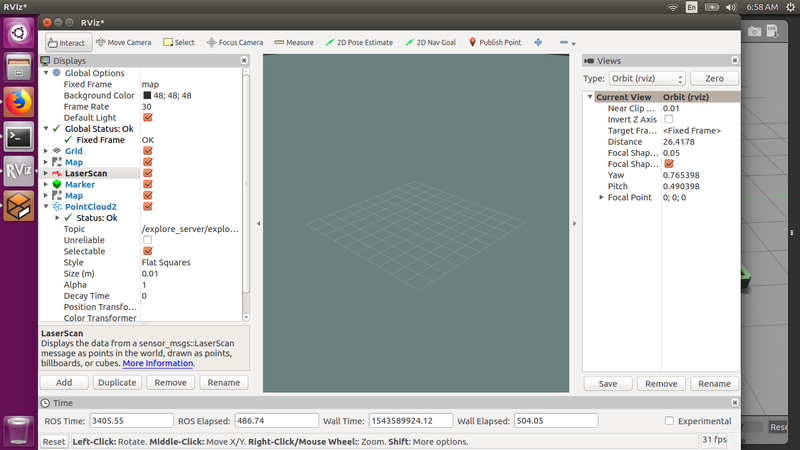 Launch amcl and map_server to start positioning robot relative to created map.